Model: Sleeveless Base Layer. Color: White. Good Luck and CRANK ON! Item Condition Item Details. Pearl Izumi Transfer SS Womens Cycling Base Layer Tops Black Sz S NWT. Condition is New with tags. Shipped with USPS First Class Package. 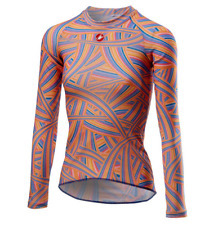 SIXS Carbon Underwear long sleeve turtleneck jersey that is breathable and thermoregulating in any weather condition. The long sleeve hugs every part of the arm to keep the skin fresh and lies between the skin and a top garment. It also slightly protects against cool drafts if a short-sleeve top garment is worn. Lastly, the mock turtleneck collar protects the throat from sudden temperature changes and cool drafts. Sleeve Style Sleeveless. We owe it all to listening to you. Material Synthetic. Video will open in a new window[isdntekvideo]. Color White. Defined Color White. Ergonomic Fit. Item Specifications. Long-sleeve mock turtleneck jersey with FullFront WindShell Carbon Underwear® windproof protection, which unlike the standard TS4 also protects the front of the arms. SIXS Air Shield technology creates a micro air cushion that defends the body without causing the classic "greenhouse effect" that increases perspiration forms. The mock turtleneck collar protects the throat from sudden temperature changes and cool drafts. Ideal for outdoor sports throughout the year. 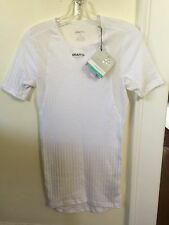 Smartwool Womans Merino 150 Base Layer Top-Short Sleeve-Light Capri-Small-NWT. Condition is New with tags. Shipped with USPS First Class Package. Crafted in Itch free, temperature-regulating merino wool with correspond technology for added durability. Easy to layer raglan sleeves improve freedom of movement. Smoke free environment. 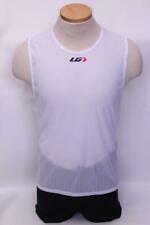 SIXS Carbon Underwear sleeveless jersey, an essential product suitable for all conditions, both indoors and outdoors. The lightest and most breathable polypropylene fiber on the market combined with a real carbon yarn that provides heat transmission and antistatic properties that protect the body from the electric charge caused by rubbing multiple synthetic fabrics against each other (condition typical of sports clothing). Skin always dry and fresh during competition and workout in any sport.